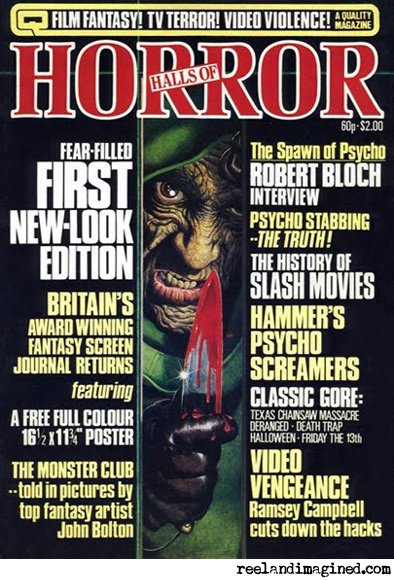 I never had a horror exile – my parents seemed to get it, and they’d often watch films with me, my mum looking away when things got too bloody – but I too have fond memories of The House Of Hammer, or rather Halls Of Horror*, as it was titled by 1983 when I first got my hands on a copy. It cost 60p, and I bought it from the largest newsagent in Aldershot, a shop opposite the Odeon where the 13-year-old me would spend 20 minutes on a Saturday morning browsing the shelves for Marvel comics and film tie-ins. The first issue of Halls Of Horror that I bought was number 25. The strip along the top of the cover ran: “Film fantasy! TV terror! Video violence!” Below it, a nasty-looking monster in a green hood peered through the centre of the page, brandishing a blood-soaked knife. As my mum often remarked as we were watching the latest video nightmare we’d rented, you wouldn’t want to bump into him in a dark alley, would you? 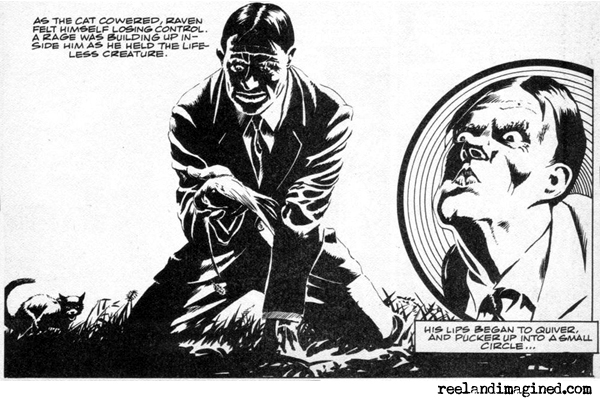 Someone else I didn’t much fancy meeting, whether or not his presence was gracing a dimly lit thoroughfare, was the Shadmock pursing his lips to whistle in the comic strip, the first part of an adaptation of The Monster Club. That was a macabre image. I found it uncomfortable to look at, but I couldn’t tear my eyes away from it. What fascinated me most in the magazine, though, was an article that claimed to be a review of The Texas Chain Saw Massacre (by John Fleming), but which was actually a plot synopsis so vivid that I could see the film play out in my head, a full 16 years before I saw it for real. I’m reminded of the tales I heard from friends at school who, the night before, had tested their mettle with videos of Damien: Omen II (“…the lift cable chopped his legs right off!”) or The Evil Dead (“…and then she pushed a pencil in her ankle!”). As a young teenager, I read this article over and over like a favourite storybook. The Texas Chain Saw Massacre was forbidden fruit, and this was the closest that I was likely to get to seeing the film, short of going round to John Fleming’s house and asking to borrow the tape that he obviously had. 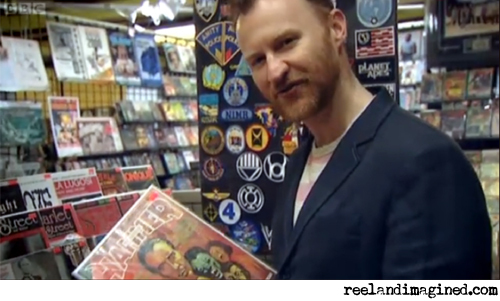 It’s fitting that A History Of Horror With Mark Gatiss stirred these memories for me, as they make a nice lead-in to next week’s programme, the third and (sadly) final part, which is titled American Scream and looks at US horror cinema of the late 1960s and 1970s. Mark’s interviewees include George Romero, John Carpenter and, yup, Tobe Hooper, the co-writer and director of The Texas Chain Saw Massacre. Who will survive and what will be left of them? I’ll be tuning in to BBC4 at 9pm on Monday to find out.